Canadian Rhae Shaw, riding for the new women's team, BMW p/b Happy Tooth, took her first win with her new team in the Stage 2 time trial at the Redlands Classic. 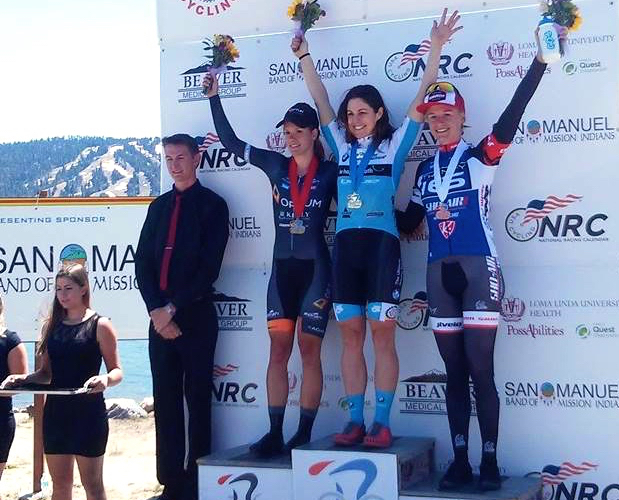 Rhae Shaw today [Thursday] won stage two of the Redlands Bicycle Classic opening the BMW p/b Happy Tooth's season on the USA Cycling National Racing Calendar with a bang. Conditions for the 7.8 mile time trial along the north shore of Lake Bear, California, were perfect and Shaw was able to hold off tough competition such as New Zealand Time Trial Champion, Linda Vilumsen (United Healthcare Pro Cycling) and former World Time Trial Champion Amber Neben for the stage win. With her personal mantra of "A happy Rhae, a fast Rhae" Shaw scorched the field in a time of 16:50 to earn the team's first NRC win of the 2015 season ahead of fellow Canadian Jasmin Glaesser (Optum Pro Cycling) in second and Allie Dragoo (Twenty16-Sho Air) in third. "I am ecstatic to put BMW p/b Happy Tooth on the top step of the podium in our first NRC race. I am really excited about the potential for the team, and I hope that this is just the beginning for us," said Rhae. "After taking a year away from racing, I couldn't be more pleased with winning this time trial. My off season preparation has been great, and this just validates the decisions I have made and the work that I have put in." Shaw now sits in fifth on the General Classification heading into Friday's Oak Glen Queen Stage of the Redlands Bicycle Classic. "The entire team has been working hard. Starting a team from scratch isn't easy, so I am happy to win this for Premier Sports Group, my teammates, our staff and sponsors and supporters."